Okay, for those who follow me, know me and keep in tune with my blog, know that I'm probably one of the biggest paranormal nuts out there! Now, I don't believe in everything (but I keep an open mind), but when it comes to spirits and ghosts, I know they are real, because I have seen them. Now this post is to exibit your thoughts on the paranormal. Do you think they are real? If so, what are your experiences? Do you think they are fake? Why do you think so? So to start off, what exactly is a ghost? It is a soul or spirit of a deceased lifeform that can manifest into the living. Now if there is one thing that I hate, it is when people always say, "It doesn't feel human. They are not supposed to be here with the living,". Now I don't believe that. It's offensive in my opinion. They still are human no matter what, just because you have died and still live on, doesn't make you non-human. Spirits have every right to be here just as we are, they are living, just in another form. We are all living in a different way. Now to talk about myself. I have been a firm believer in the paranormal for a 'very' long time. I quoted 'very', because it is as long as I could remember. I get initutions, gut feelings (which are always true), deja vu all the time, oh I can see spirits (only when they want to be seen), and visions that come into dreams (it only happened once, but I still count it in). Okay, I'll start off with my vision that came into a dream. It was only last year, when my brother was still in high school. One night, I had a dream that my brother was in trouble. He was with a group of other people in a busy market place, locked in a room because a crazy gunman was roaming the area. 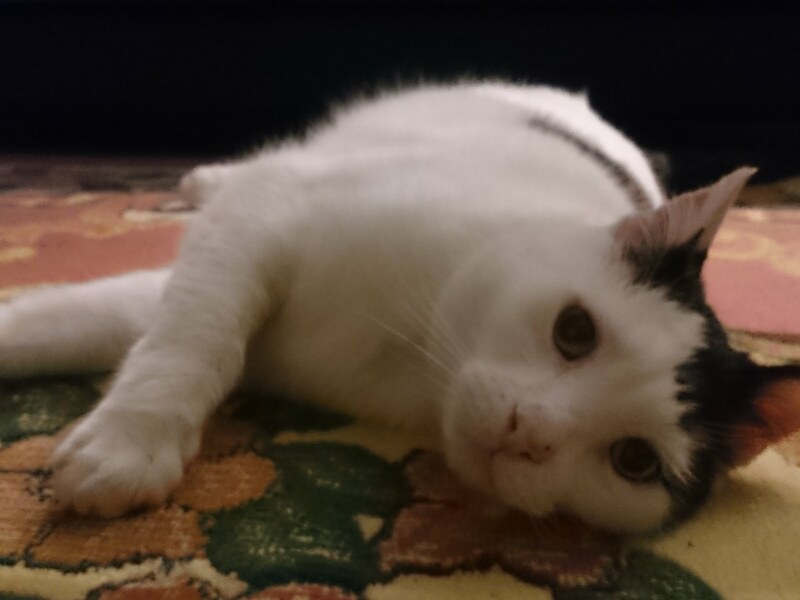 I remember being panicky and frightened for his safety, running through the market trying to find him. I woke up, and brushed it off. It was just a dream, right?? Wrong, I actually had a premonition, and I never realised it until the next day. Gut feelings, I always get bad ones, so there are too many stories to tell for that. I could probably go on all day writing about it. Now, you might think I am a sort of religious freak. I'm not. I might have been born into a religious family, but I am not religious myself. I believe in what I want to believe. My very first experience was when I was about 7 years old. It was night, everyone was soundly sleeping, except for my parents and me. I was and still am a very light sleeper, any sound will wake me up to this day. My cousin who used to live in Singapore back then, was flying in to Melbourne, so my Mum went and drove to pick her up from the airport. Now mind you, it was raining really heavy that day, and I used to sleep with the door open, because I was afraid of the dark. I mean, who wasn't back at that age?! I used to share a room with my brother back then, and he used to sleep like a log. I mean, not even an earthquake could wake him up. So anyway, I was lying awake, listening to the rain. I hear the phone ring, and my parents light was on (the room was just in front of me). I heard my Dad's voice, and gathered that he had to go pick my Mum up. I found out later that her car broke down in the pouring rain, on the way to the airport. So my Dad left the house, with my brother, my older sister and I in the house. Now, I am a TV addict, still am, but back then, even early in the morning, when my Dad left I got out of my bed and headed towards my parents bedroom. Just as I left my doorway, a white figure of a man stood in the doorway of my parents bedroom (which later became my room), blocking my way of going in there. Now I was young, scared and I knew straight away this was a spirit. My heart was racing and the spirit lifted his finger and started swishing it back and forth, like gesturing to me to not go any further. I ran back into my room and tried to wake my younger brother, but as a deep sleeper, he wouldn't wake. I ran back under my covers and and shivered myself to sleep. Now I still remember what he looked like even to this day. He had a turban, yes, a turban, and he had a long white beard with white clothes. The next morning I told my mother about it. She asked me to describe what I saw, and I told her. Then, she showed me a picture. It was this picture. I automatically said yes, this is who I saw that night. It sounds so unbelievable, but I kid you not. 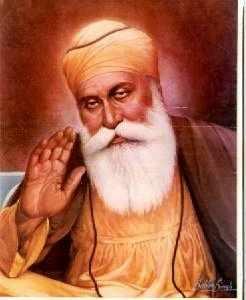 This is Guru Nanak Dev Ji, he is the founder of Sikhism, which is the religion I was born into. Now I never knew anything about the Guru's back then, but that night changed my life. Now I said before that I wasn't religious, I'm not, but I do believe that Guru Nanak is real, because I saw him, as well as my mother a long time ago. It would take too long to explain who he is, but my words before describe most of him. Now you might wonder why, how can I not be religious after experiencing something like this? That is an entirely different topic, and my own reasons altogether. Now you would think, ah she was only 7 years old then! It's just her imagination! I never even saw a picture of him before that, until that morning when I found out who it was I saw. When I look back at the day now, my Mum tells me that every morning before leaving for work, she would pray to the Guru's to keep us (her children) safe. He did indeed look out for me that day, and apparently if you see an apparition of him, you are blessed for life. That was indeed a special moment for me and my family, not many people will get to see him at all! I will never forget it. Come my second experience. It was the same room, different year. Same room I mean by the one I was sleeping in. My brother (again sharing the same room) went out the room to get a glass of water. I was probably about 9 years old, and I was lying in my bed. Suddenly in front of me, a white apparition stood in the corner of my room. It was really tall, and I can still remember the patterns of it to this day. It was like a really, really long veil, I couldn't even see the face. I screamed, ran out of the room and joined my parents in the family area. They came into my room after I told them what happened, and it was gone. To this day, I have no idea what it was, but it scared the hell out of me. Another experience was in the same house, different room. This time I was sleeping in my parents old room, as we renovated and they got another one. My aunt and uncle from Singapore had come to visit, and we were sitting in the family area of the house talking. From my family area you can see into the rumpus area. My uncle walked past and suddenly behind him I saw a transparent figure of a man in a brown coat, with a brown hat. That very second, he disappeared. I have no idea who he was. Another experience was in like 2006. I was in the family area, watching Lost by myself. Just when Lost finished, I had this sudden feeling that someone was watching me. I looked behind me, nope, nothing. I looked in front, nothing. The TV controls beside me made a sound like someone was squeezing it. Then suddenly from the rumpus area, a white apparition flew at right me. I screamed, and ran into my brother's room, which wasn't too far away. He asked me what happened, and I told him a white figure just flew right at me. At first he didn't believe me, until he saw how badly I was shaking, then he started to get scared. We got my older sister, and she calmed us down. Now between all those years, we have seen black apparitions pass through our house. I like to call them 'the shadow people'. My whole family, I can safely say, have all seen them in our house. Sometimes they imitate our family members voices, by calling out our names when they are not at home, and no it wasn't our imagination. I've had way more experiences in that house more than anyone in the family, especially with the shadow people. Now that room, my parents old room, my room now, seems to be a magnet for the shadow people, just my luck eh? I remember at one time, I was in the toilet, I came out was just about to get into the bathroom when a black shadow ran out of the doorway. I ran speeding down the hallway and washed my hands in the kitchen sink instead. Now the shadow people don't hurt you, they just like to pass through the house every now and then, and we just happen to get a glimpse of them. Even though they mean you no harm, the reason I get scared is because they give you no warning, they just appear there, out of nowhere, and give you an instant heart attack. It's a flight or fight response, and my body automatically goes into flight mode. Once I was home alone, and I was on the computer writing a story, when suddenly I heard my mother's voice yell my name out angrily, it sounded far away and distant and I knew she was at work. I got freaked out, and called her straight away and told her what happened. 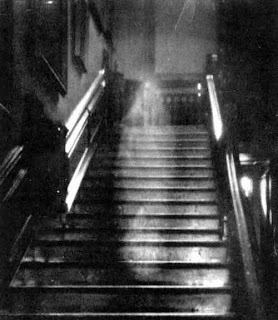 Our family have had this happen loads of times, and their apparitions seemed to be everywhere in different parts of the house. No our house isn't haunted. We built it from scratch, so we know it wasn't haunted. As I got older, I started to do research about the town I lived in. Now the only history I could find, is Ned Kelly. his grandparents used to live here too, he was infamous. Don't know who Ned Kelly is? Look him up. Anyway, I couldn't find anything relating to the land of my town, only that it was a small farming community in the 1800's and aboriginal land. I guess the spirits were just passing through, huh? Now we have moved from that house, after 17 and a half years of living there, I still miss it. But we are only living in the town next door, so it's not that bad. But I have had experiences in my new house. It was my sister's birthday, and she went out with her friends for birthday drinks. I walk past her room and the door was closed right, but I see underneath a shadow passing back and forth as if someone was pacing. I thought it was my sister, because I didn't know she went out. I told my parents, "Why is she pacing in her room?". They looked at me and, "She's not in her room, she's gone to the City with her friends,". I run to her room and open the door, nothing. Nada. My family have had loads of experiences, I'll only mention one, because it's something which has stuck to my mind a lot. Okay, my parents and my sister were living in a rented house, my brother wasn't born yet and my mother was heavily pregnant with me. One night, my mother was lying awake, with her door open, and she suddenly gets this feeling. She sees my sister (who was about 9 years old then), creeping past her door, with another little girl behind her. Now this girl behind my sister, wore an ancient dress, and she carried a doll in her hands. It looked like my sister and this unknown girl was playing hide and seek. My mother didn't worry, she didn't get a bad feeling, and she knew this spirit wouldn't harm my sister. Then next morning, my mum tells my dad what she saw, now mind you, there is an attic in that house. My Dad went up the attic to investigate and hopefully tell us what she saw. He found a trunk. He opened it, took a look inside, and quickly scrambled down the attic with a look of disbelief and shock on his face. What he tells my mother, chills even me... I'm pretty sure she freaked out a bit, it was the same dress that girl was wearing and the same doll she was carrying in her hands. After that they moved, haha, I can see why. But when my Mum tells us this story, I like to think that the girl just wanted company and someone to play with. I've tried to look up the history of the house to no avail...I'm still going to keep trying and find out who she was and how she died. There are a lot more spirit experiences, but it will take too long writing them on here. If there is another thing I hate, it is when skeptics try to find reasonable 'scientific' explanations of what we see. They think we are crazy, hallucinating, dreaming, making up stories. They think little kids lie to get attention, but what they don't know is that when you are young, you are more incline to spirit activity than most ages, it can disappear as you get older, or it can stay. Ha, I once read that anyone who sees 'the shadow people' are in fact schizophrenics, now that is really silly. I am really in touch in my spiritual side. But even I can be a skeptic at times. Like when people on television come on to say they are psyhics, I don't believe it, I think the media makes them up. I like to believe it, to see it. But the thing is, what you see, you cannot prove, and that is why sceptics are on the move about spirits. There is technology, even the simplest at times, that can capture the apparition and audio of a spirit. Just last year, my great-aunt passed away from Alzhiemers. My mother went back for her funeral. It really affected us all. Now in our religion, for some reason, only the males can be present at the funeral itself, and she was cremated. My uncle took pictures of my great-aunts ashes (and bits of her bones, which kind of freaked me out as I saw part of her skull!!!! 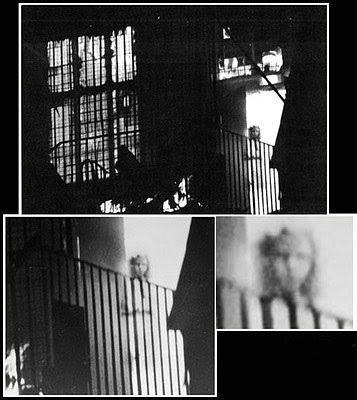 Sheesh), and when the photos were developed, there were ghost orbs everywhere in the picture. Now you would think they are just dust particles, but it wasn't. I have pictures to prove it, but I can't find them at the moment. I'll try and find them. My Mother went back to Singapore for his funeral. When my Grandfather was cremated, he was cremated with Jasmine flowers. That following day, the family were at my uncles house, just talking about memories. My cousin, at the time who was just born a few weeks ago, started giggling and laughing and looking right above her. There was no one beside her, and suddenly my Grandmother, Mother and a few family members, got a whiff of Jasmine. They knew my Grandfather had come back. When my mother was on the plane back home, she was crying and upset, of course she would! When suddenly she got another whiff of the smell of Jasmine. Everyone was sleeping at the time, and my Mum knew that her father was comforting her. She and my Dad, got the smell again a few times after that, whenever my mother was upset and thinking about him, he would come and let her know that he is still there. After a couple of years, the smell stopped. But there is one thing that I can say, we are not the only living entities in this world. It is interesting to read about your experiences and belief in ghosts. I'm also a paranormal enthusiast, to the extent that I want to research in it some time in the future. However, I'm more into extra-terrestrial life, parapsychology, cryptozoology, and ancient beliefs. I have written a few posts related to them on my blog. I'm not too much into ghosts and spirits, but that doesn't mean I don't believe in them. But then again I would say that I don't truly believe in them also. I would surely like to believe in ghosts and even though its going to be scary, I would love the experience to be face to face with a ghost or spirit. I used to watch a lot of television programs related to this, during my school days. I've heard a lot of stories about ghosts and spirits from people, but never had any experience yet. I'd also like to comment on something you said about skeptics. Some paranormal events do have scientific explanations, but that doesn't mean all them have it. Somethings in life just can't be explained. But trying to investigate it always adds to the interest. We should not ignore the scientific explanations. I like your blog ... and it's good to know about another paranormal enthusiast. take care! found your blog via SGHC, some cool entries, especially this one. I noticed that you currently live in Melbourne? That's cool. Melbourne is a cool city, been there once to visit my dad. But the house he was living at the time was HAUNTED. for one whole week my family had difficulty sleeping at night. Anywho, keep up the good work! and post more experiences, they're scary! Hi Mindy, I am also from Melbourne, I love your ghost blog. I really enjoyed reading your experiences about the ghosts in your houses of you and your family. I think you have a special gift that you can see spirits. I have never seen any ): but some of my family members have like when i was 10 years old we went to Port Arthur and my parents saw the famous 'lady in blue' and my dad used to live in a haunted house before he got remarried (before i was born) and lately my brother who is living with his girlfriend in a house that is reportedly haunted and my brother actually saw the ghost of a men with a old hat on he said he wore old fashioned clothes, the ghost was there before he moved in with her because she and her sister saw the ghost as well. by the way i hate skeptics as well some things can not be explained and i am a big believer in life after death I am catholic but i am not that religious my interests are in life after death, ghosts. I had an experience one time when I was six. I was lying down in my bed sleeping. My two other sisters and I shared a room back then. Anyways, I woke up in the middle of the night and seen a figure that looked like a little girl standing by the bathroom which was right in front of my room. It was dark and I was too afraid to turn on the light. So I stuck my head under the covers and fell asleep. I was sure it wasn't anyone else in the house because my sisters were the only other small children in the house at the time and they were asleep. Now to this day I continue to think about that experience and just wish that I could have found out what they wanted or if i could have helped them. It was weird but it wasn't so frightening that it scarred me. It just made me open my eyes and my mind. Want to always be updated with my posts? Submit your email now to subscribe.